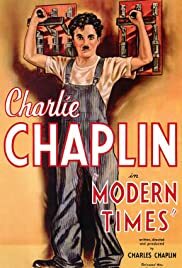 The Tramp (Charlie Chaplin) is just a cog in the modern machinery. He is unable to keep with the production line tightening bolts. The owner picks him out for testing the automatic feeding machine. By late afternoon, he gets lost in the machinery. He can't stop tightening causing great damage and they send him to a mental hospital. He gets out but he doesn't have a job anymore. A red flag falls off the back of a truck. He picks it and a massive march starts behind him without he knowing it. The police grabs him thinking that he's the leader. In prison, he helps thwart an escape attempt and is released. A Gamin (Paulette Goddard) is stealing food for the children. Her unemployed father is shot dead leaving her little sisters sent off to the orphanage. She steals a loaf of bread and runs into the Tramp. He tries to take the blame but she's caught anyways. He prefers life inside and deliberately gets caught stealing. They get thrown into the same wagon and escape getting thrown out together.